The Travelling Teddies: A Fishy Tale On A Diwali Weekend! 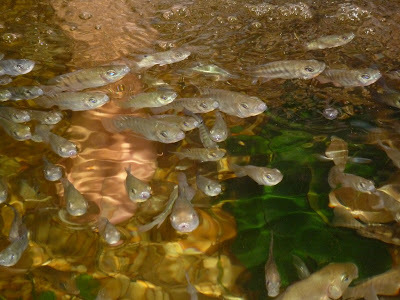 A Fishy Tale On A Diwali Weekend! Whoa... What a weekend it had been for The Travelling Teddies. We spent the looooooong Diwali weekend, home-away-from-home style and it was probably the awesomest ever. It's been quite a while (since the start of Ramadhan) that we get to leave the comforts of our individual lair and into the wild world of pleasure and pamper. We bitched about all sorts of things and slept at 2am and slept in till 9am the next morning... stroll our way down to breakfast in flip-flops and bermudas (where Cubbies got her 3 rolls of butter croissants - yayyy! - and baked beans eaten with Rocket leaves - just the way she liked it!)... went up to the room again and continued hibernating till checkout. What a life! If only every weekend is a long Diwali weekend, i'd be a happy happy bouncy bear! Anyway, after we checked out, we made our way to lunch before heading home. 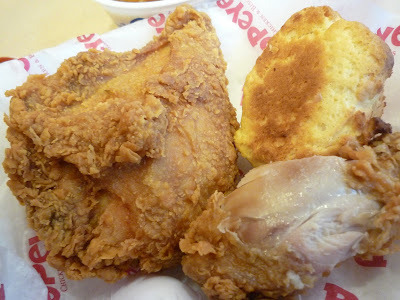 Meebops suggested Popeyes Chicken. The outlet that we usually go to when we have the cravings for hot juicy chicken thighs (and breasts for Cubbies) is the one at Changi Airport Terminal 1. And since we were in the city that day, we decided to give the outlet at the Singapore Flyer a shot. Meebops' been there before so it was a second time for her but as for me, it was my virgin experience on SF grounds. Man, it was breathtaking! TSF was a huge complex with a quaint little sanctuary at the foot of the flyer, which i'd really like to walk around in when the weather is better, because as soon as we reached SF, it started pouring! So we took a break and went for lunch first since we were by then, famished. We ordered the usual fare of 2 chicken set each (upsized, with large mash and slaw) and a side order of that moreish red bean and rice. This is the Cajun Mash - upsized! The gravy, which is laden with gizzards and fats, herbs and chicken shreds were absolutely to die for. 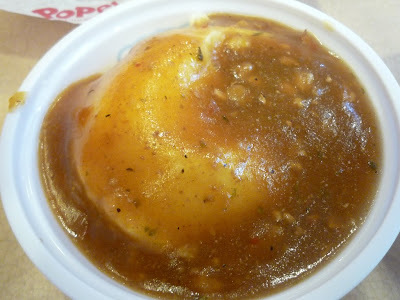 Unlike KFC (whose potatoes tasted earthy and probably blended till almost powder-like), Popeyes mashed potatoes are lumpier and close to perfect! Very tasty and makes you want more more more! I licked it all off to the bottom of the plastic cup... Heh! OK... so the photo didn't do as much justice as i had hope for. 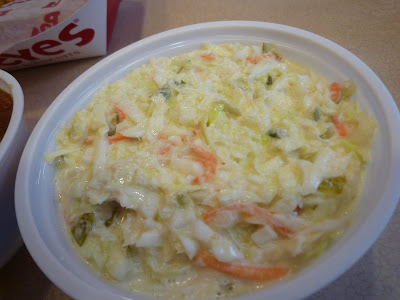 Looked a little mushed up but if you have never been to Popeyes, you probably haven't tasted darn good fast food coleslaw. You have to try it. Definitely a star award from The Travelling Teddies! We also ordered a regular side-dish to go with our chickies. 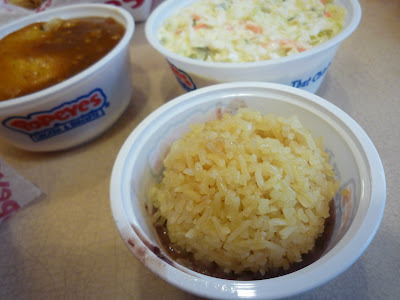 This is also their famous Red Bean and Rice side which is very very tasty even on its own... Simply finger lickin' good. Meebops is not a big fan of red beans and neither am i but we simply can't resist this lil' number. A mixture of light sweetness and greasy goodness. Even though Cubbies is on a no-rice diet but heck, for this one, i'd take a day off - and i did! Haha! Ahh... well well... spicy fried chicken never tasted so good! Cubbies didn't even wash her hands before eating (bad, bad Cubbies!) and before i took the picture, i couldn't resist a bite off the chicken drumstick! I am personally not a big fan of their buttermilk biscuits (crispy on the outside and soft on the inside) but i had it all to myself this time! Yum yum yummy!!! Big Fish, Small Fish... and Medium ones. 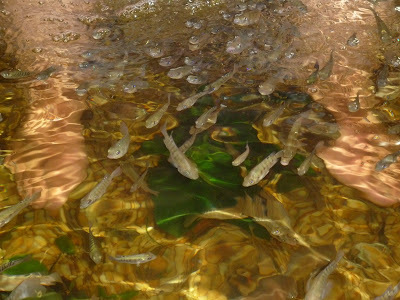 As a start, i wanted to give the tiny fishies a treat but the masseuse directed us elsewhere. I didn't like the fact that we were "optionless" but to the medium fish tank she showed us and there we went... It was intimidating just by looking at it! See.. the one sitting on the opposite side of the large tank is Cubbies... Yup the one with white, pale, fat legs and curled up paws. See Meebops? Both her feet are already in the water, fully submerged! It costs us S$38 (per pax) for a 30 minute "fish massage" and a 10 minute shoulder massage (which to me is super lame anyway). My gut feeling says that all this hooblah is painfully for pure entertainment sake but according to the website, the fishes actually nibbles off dead skin cells on your feet and helps improve blood circulation, lighten minor scars (which i don't have on my bear paws anyway...), ease eczema (poor fishies...) and releases stress and tension (the stress of dipping your precious feet to a swarm of hungry nibblies?... yeah right!). Meebops was a lot braver than i gave her credit for!!! Bravo Meebops! She started her spa treatment first by dipping in both her feet, without much hesitation! A little squirmish at the start when the hungry fishes started nibbling but she was a-OK after 10 secs of giggly gaggles...This is Meebops and her paws in water. "The fishies seemed confused... They're swimming the WRONG direction. The feet's THAT way!" Cubbies couldn't bear to let the fishies nibble on her cute little fat paws!! So i dipped my paws in and out and continued to do so for at least 10 minutes (time is money...) before i fully submerged them for the fishes to devour. Aw man... I kept going, "I'm scared... eww.. aarh... takut la.. yakkk! Oooo... arrggh... eeek.. gasp!.." What an embarassment! And after much coaxing from Meebops and from within my brave little self (and reminding myself how expensive this treatment is...), i finally dared to dip my fat paws into the water. Not sure if this is sanitized though... but its hard not to think negatively about how polluted the water may be when probably thousands of people already dipped their dirty smelly feet, before they changed the water to a fresh one! BAH! My Feet In With The Fishies from thetravellingteddies on Vimeo. 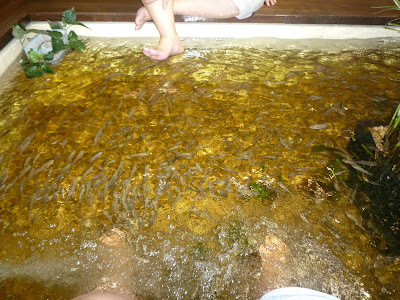 My verdict is that the Fish Spa was a refreshing new experience for me to bond with the fishies. Its not that i do not like it, but i am not comfortable with the idea of exploiting ignorant cute little fish friends and getting them to nibble on my "dead skin cells" - which is really, simply treating the fishes with disrespect (and as second class citizens) but it was an experience that i may probably try again (with larger fishes next time, Meebops?). I will stop after i feed the larger ones out of sheer respect. The shoulder massage was very disappointing for me, personally, cos Meebops said hers was pretty good. What a pawwing day it was.. despite the embarassing moments! Its All About Momentum They Say! The Little Puppy Says CUBBIES IS AWESOMENESSSS!